Warm oil and honey in a skillet for one minute over medium heat (300 degrees in an electric skillet). Add powdered milk and vanilla. Stir in oats and sunflower seeds, and mix until coated with oil and honey mixture. Heat over medium heat. Stir until oatmeal is slightly brown. Take off heat. Stir in raisins. Cool mixture. Store in an airtight container (jar or plastic bag). For a less expensive and dairy-free version, omit the dried milk. Nutritionally, there will be slightly less calcium. Try baking this dish instead. Once the first six ingredients are combined transfer to a baking pan and bake at 325 degrees Fahrenheit for twenty minutes or until golden brown, stirring half way through. 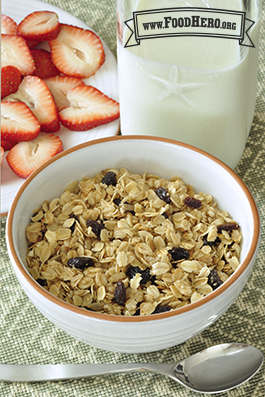 Try adding any of these ingredients: one teaspoon cinnamon, chopped nuts, dried fruit, wheat germ, or coconut. Serve with milk, yogurt, ice cream, and/or fresh or canned fruit. Honey is not recommended for children under 1 year old.